A foremost social orientation and civil liberty group in Akwa Ibom, Akwa Ibom Liberation Movement (AILM), has called on the Independent National Electoral Commission (INEC)'s Resident Electoral Commissioner (REC) in the state, Mr Michael Igini, to ignore the All Progressives Congress (APC) and Senator Godswill Akpabio. Senator Akpabio and his party, the APC, have in the last few days, been calling for the redeployment of Igini. The AILM during a press conference held in Uyo on Monday, February 18, described the ongoing campaign against Igini, led by the state chapter chairman of the APC, Ini Okopido, as “shameful, misleading and unsubstantiated. According to the leader of the group, Prince Emmanuel Sam, the APC may have started calling for the redeployment of the REC after all measures to compromise him have failed. His words: “We in Akwa Ibom Liberation Movement, pass a vote of confidence on the REC, Mr. Mike Igini because going through his records we have seen that this is the best man to ensure a credible election, where every vote will count. He can not be compromised and knows the job. 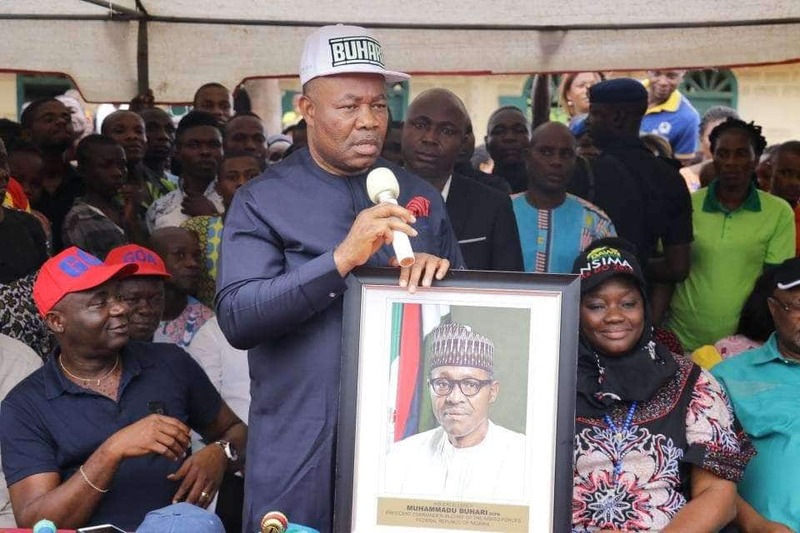 “We believe the so called protest by the APC leadership is merely acting a script written by former state governor, Senator Godswill Akpabio, who has seen that his presumptions about influencing voting across the state for APC have failed because the party did not campaign widely but relied on using 'federal might' to intimidate voters and force electoral officials to rig election for his party. “We therefore advise APC leadership to channel its energies toward rallying members and supporters to vote rather than engage in propagating frivolous and wild claims. AILM wondered why the party that once celebrated the deployment of Igini to the state could suddenly turn around to call for his redeployment. “We are aware that APC is uncomfortable with the uncompromising stance so far displayed by the REC. The state chairman of APC, Ini Okopido, is frustrated that his party will not enjoy undue advantage in the coming elections. “Recall that APC stalwarts have been boasting of using 'federal might' through the police and INEC to subjugate the will of the people in the coming elections. Apparently, the refusal of Igini to play ball may have struck a wrong chord in the party hierarchy, resulting in the agitations for his removal,” the group stated. Meanwhile, Governor Ibrahim Dankwambo of Gombe has accused the APC of destroying public property in the state during the party's rally last week. Governor Dankwambo made the allegation on Saturday, February 16 in a statement sent to journalists by his senior special assistant on press affairs, Alhaji Junaid Abubakar Usman. According to the governor, the APC hired thugs from neighbouring states who destroyed public utilities worth over N500 million.